Previewed at: Roadshow Films Theatrette, Pyrmont, Sydney, on 6 March 2018. Ai Weiwei is arguably China’s most recognized artist/political activist living in the West. Currently he is headlining this year’s Biennale in Sydney with multiple works centring on the global refugee crisis plus the launch of this documentary, Human Flow, which covers the same subject. These ventures deal with “… the suffering and the tragic life of our global community” and reveal the state of human misery that’s evolved out of climate change, famine and wars, both civil and imposed by invasion; the resulting displacements have caused over 65 million people to flee to other countries. Human Flow takes the audience on a distressing journey following this massive tide of refugees through countries that include Afghanistan, Bangladesh, France, Germany, Greece, Iraq, Israel, Italy, Kenya, Mexico and Turkey (23 countries in all), visiting 40 refugee camps. And what a depressing trip it is. We are routinely subjected to many terrible images while watching the daily news on television but nothing quite prepares you for the detailed and horrific scenes that leap off the screen during Human Flow. There are many heartbreaking, intimate interviews with people who have suffered and continue to do so, as they attempt the seemingly impossible task of finding a safe haven in the world, having been forced to flee their own countries. Examples include a middle-aged couple reminiscing about their homeland, a place where they were happy and self-sufficient but were forced to flee; a woman who Ai Weiwei interviews with her back to the camera, who is so overcome by her plight that she vomits as she speaks of the ordeal of being displaced and the trauma of travelling with her young child; and two brothers who hold each other sobbing and promise ‘to follow each other to hell.’ These and other scenes make you feel utterly overwhelmed by the enormity of the tragedy and the sheer size of some of the camps has to be seen to be believed. Footage from cameras fitted to drones that slowly descend from great heights initially appears to be focussing on ants, until you realise that these are vast numbers of human beings and the rows and rows of shelters laid out in grid patterns are their makeshift homes, with rarely a piece of vegetation in sight. The camps are as bleak as the state the refugees are in themselves. 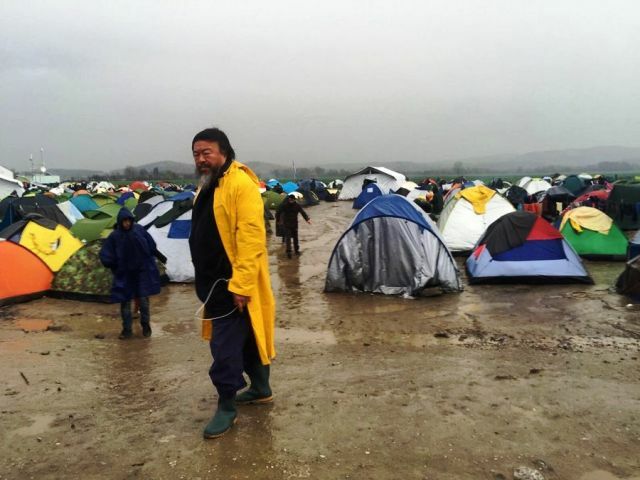 Ai Weiwei does not hold back and is filmed in the midst of the crisis. His involvement seems to amplify just how dreadful the situation is as he wanders through the masses with a mixture of incomprehension and compassion. This is possibly one of the most important documentaries to deal with the current refugee situation encompassing the world that you’ll see and it reveals the true extent of the problem; we often have these stories shown to us piecemeal - to see them in one film is eye-opening. Surprisingly, despite its 140 minute running time and the depressing similarity of the protagonists’ tales, the film doesn’t feel overly long. Human Flow looks at a problem that is not going to go away any time soon but if enough people are exposed to the appalling statistics and see for themselves how tragic and shocking the issue is, maybe, just maybe, governments will stop turning a cold eye on those who are less fortunate than we are, because as the saying goes, ‘there but for the grace of God go all of us.’ Something has to be done, the questions are: When? Why not?